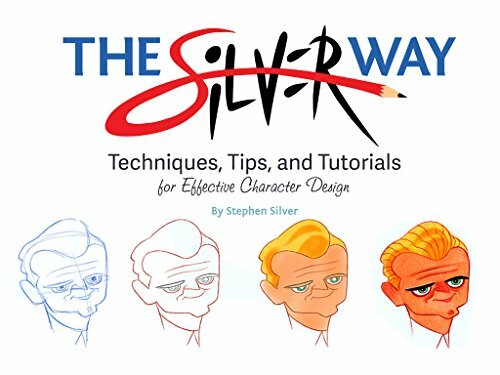 This may be the best book on character design that I've seen. Stephen Silver, if you don't know, is an experienced artists, a veteran, who has been working in the art and animation industry for years. His forte is the ability to create interesting and varied characters. I've actually featured his first artbook The Art of Silver in 2009 and now he's even better. In this huge and 248-page thick paperback book, he has filled the pages with lots of actionable techniques, drawing tips and insight. I had only gone through a few pages and I already know the book is a gem. This guy is a pro, knows what he's talking about, the best thing is he's great at teaching in ways that people can understand and follow along. The book is loaded with useful techniques that he has learned over the years. The illustrated examples give you a clearer idea on what's he's talking about. The book also works as an exceptional reference because there are so many examples you can refer to. The price on Amazon USA is around US $23 which to me is an incredible deal for the content you're getting. I'm putting this down as one of the better artbooks from 2017. Highly recommended. As a bonus, be sure to check out his Youtube channel where he shares advice and tips too.